When you think about the anticipation of a new baby and all the excitement that comes with it, the first image that pops into my mind is a tiny hospital room full of way too many people. Bright blaring lights. The beeping of machines. And the constant in and out of doctors and nurses. Oh, and the visitors, all the visitors who come right when the baby is born and new mommy is figuring out what to do with this new life while recovering from one of life’s biggest journeys of the female. After experiencing how overwhelming those first few postpartum days, weeks, months were for me, I can ONLY imagine what it must be like for that ity, bity life that just arrived from this dark, cozy, rather quiet, confined, world after nine months of developing. I mean, look at us after traveling from one side of the world to the other. We need days, sometimes weeks to deal with jetlag, time change, weather change…pretty much any change. We need time to adjust. And even though these little humans aren’t able to express it, they just had a long journey into a world brand new to them. Everything is new. Everything is a change from where they came from and they begin learning and adapting from the moment they arrive. One of the key things, I observed with all of my children when they were first born is how much they stare. I specifically remember my husband and I discussing this about our firstborn. Hours after he was born, when we found him awake, he would be dazing off into the distance. In our culture, they say he is thinking about his past life. But whatever it is he is thinking about, it is amazing to see how long they are able to stay fixated on their thoughts. Sadly, we would have never noticed any of this if we had a parade of visitors coming in and out of the hospital and our home, especially during those early days. Between trying to figure out how to (breast)feed this new life, recovering from (a rather painful and traumatic) delivery, function from a lack of sleep and managing the rest of the family, it was really hard to imagine making time for visitors while being able to welcome and bond with my new baby (especially after we had the twins!!!!). Fortunately, before our first child was born, my husband and I were inspired to read a beautiful segment in one of our Vedic scriptures (an Upanishad) about the journey of a new life into the world. This reading focused on the importance of those first few months outside of the womb. One of the key takeaways was about a newborns ability and need to observe and take in the environment around him/her. It talks about how significant the early days are for developing and strengthening their own awareness & concentration. This was one of the reasons we decided not to have any visitors for the first two to three months of each child’s life. 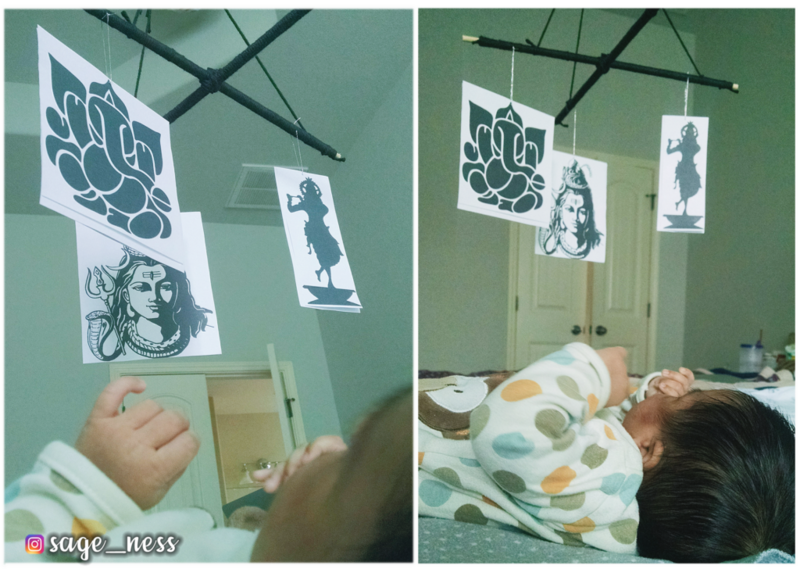 We allowed each child time to adjust to their new world, we “prepared their space” by giving them a quiet, calm (minimal overstimulation), pious environment with positive thoughts, with no visitors, no (major) distractions from the outside world and exposure to one or two images of our Hindu deities to focus on. This time period not only is considered a very precious time for mommy and baby bonding but also a time where newborns are developing the foundation of their concentration, focus, and memory. Concentration and focus begin as early as birth, I have been blessed to witness this early development now with 4 kids. There are so many similarities in what is said about a new life in our Hindu Scriptures and what Dr. Montessori has observed and identified through her studies. After a little bit of research, I learned that Dr. Montessori spent a lot of time in India, and went back multiple times during which she published a few books too. She also spent the earlier part of her life reading educational philosophies from around the world that were over 200 years old. Some of this overlap may have been a result of Dr. Montessori’s findings, studies, and observation through Ancient Indian literature and her time in India. It’s been a journey for me to see my cultural beliefs tie in so closely with Montessori’s overall approach to the development of a child. I continue to look for ways to bring together the Montessori approach with my own importance on the Indian culture. Since our newborn is still in her first few months of life, she remains in her prepared space as she adjusts to life outside of the womb. With the limited time I had, I made this Montessori (Munari) inspired mobile for her. 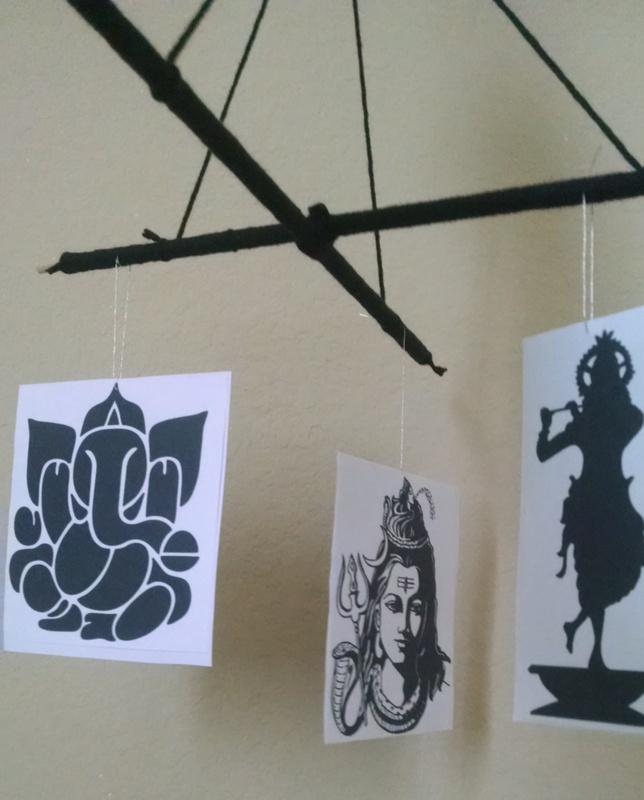 It is a high contrast of images (instead of shapes) of our Hindu deities for the developing newborn eyes and mind. This, along with opportunities to concentrate, focus and stimulate the senses with positive thoughts, sounds and visuals are given importance during the newborn phase in our cultural readings. This DIY mobile brought the best of both to her environment. 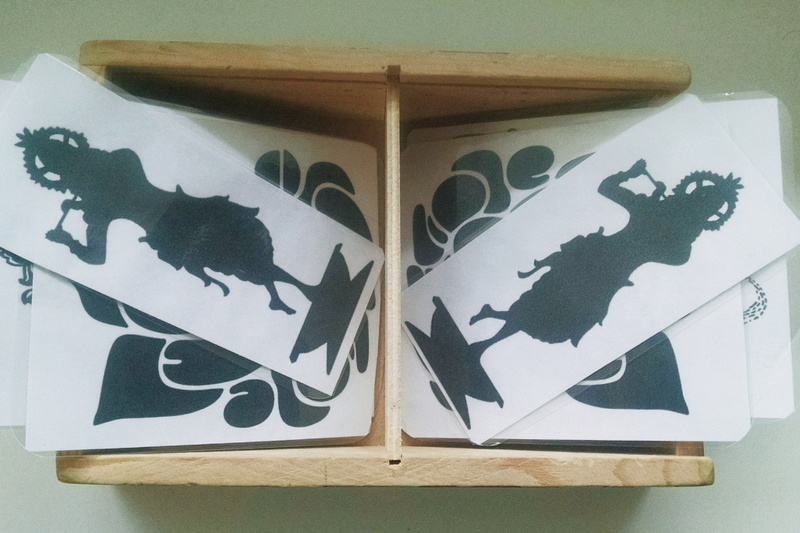 Our printer malfunctioned so I used the extra printouts to make, matching, visual cards for the toddler twins. They have loved them! You are SO welcome! This makes me so happy! Congrats on your newborn Jaya :).